Before I tell you something amazing, you should know a little about why this is important to read all the way through. I am a regular person, an avid motorcyclist with a passion to take my riding skills to new heights whenever I can. I’m a real estate broker—just another guy out living the life I want. No different from you. I go out and take as many courses as I can to BE a better rider. I’ve taken several group riding courses, jumped into advanced skills courses, and even took an off-road course although I don’t own an off-street bike. My primary ride has a sidecar. I haven’t put my feet on the ground in 20 years, and it doesn’t stop me from getting more information for that time I might need to use it at a sudden later date. It’s my responsibility to be seen the best I can and to be ready when I see trouble coming. As I’ve covered this on my TV show, Bike Week America ( http://www.BikeWeekAmerica.com ) many times, it’s our job as riders to be ready for anything. Three years ago, I wanted to re-up my CPR card. My old one was lost along the way, and I knew it was expired anyways, and I was on Facebook at the time, so I searched it out. Up popped this class called “Bystander Assistance for Bikers,” so I clicked on the link and my world changed. After taking this easy-to-learn course, I quickly found the huge need to teach EVERY rider how to be a better rider and now, because of that one link, I am a certified teacher showing bikers how to be better bikers. By showing it’s OK to treat the injured when an emergency happens in front of you, for whatever reason. By showing leadership in brotherhood to take care of your brothers and sisters, especially when they need it most. This summer was the first summer out on two wheels in years. I picked up a used Yamaha to use just for medical missions (43 in all this year) and found it a different road from the one I remember in the sidecar. You’re not as likely to be seen on two wheels, and that was a huge shift for me. It really brings home the point: just what would happen if I went down? We know the risks (or at least we try) when we saddle up behind the handlebars. We take precautions to make sure we arrive at our destination. From helmets to leathers to orange safety vests, we know we have a better chance to arrive safely if we go into protection mode before we press the start button. As much as we try to make it ‘there’ alive, the unpredictable does happen. This is where riding takes on a whole new level: what should you do when a rider next to you needs immediate emergency care? For whatever reason? It’s not like we plan our rides around hospitals—the exact opposite is true. We ride where the road calls our name, usually in areas where a hospital is far in the rearview mirror. What would YOU do? No really, think a minute, WHAT WOULD YOU DO? This is a question a lot of people face, in the blink of an eye; you need to have an answer. How would you feel if you had nothing when someone needed you? No one should have to face that. And with budget cutbacks and thinly staffed EMS teams, it’s rarely you’ll see help arrive in two minutes. That’s why it’s important to have that answer BEFORE you have to face it. Believe it or not, there is a course that teaches all you need to know to make a difference when seconds count. Accident Scene Management, Inc. (ASMI), A Crash Course for Bikers, is THE international standard for everyone, biker or not, to make action happen when it’s necessary. It’s taught in an easy-to-understand format, so bikers and drivers alike can walk out of a class ready to be first responders. Sadly, one third of us are going to need to use that training at one time or another. I’d rather be ready to do all I can than not know anything at all. ASMI Basic and Advanced courses were designed by a Registered Nurse and EMT, Vicki Sanfilipo of Big Bend, Wisconsin, in 1996. After seeing the need for on-the-spot treatment that would have prevented further injuries, she set out to do something about it, and the course was born. Accident Scene Management is a hands-on class that builds from the basic first aid and life- sustaining actions you’ll likely need. There is no fluff here. The course is packed with facts and tools you’ll use in everyday life. The Basic class shows HOW to make a bandage, even if you don’t have a medical kit, and how to prevent further blood loss, and why that is critical to a patient’s recovery. You’ll also learn the LEGALITIES of what to do when you are the first on scene, something that stops many people, which is easily resolved through Good Samaritan Laws. Basic also shows two-person helmet removal, and when it should be done (yes it has a time and place) and also shows the steps to take, in order to protect yourself, the scene, and the patient. It addresses the challenges of contacting EMS (and steps to take when cell phones are useless) and treating the injured, and in what order. The Advanced course is built around the Basic skills and takes them to a higher level, including backboarding a patient (and when it’s necessary), splinting, femoral traction application, the steps of a head-to-toe assessment, prioritization of injuries, and the role of emotional support and calming techniques in a critical situation. These comprehensive courses are taught by trained instructors, who take little to no money so all riders can be properly trained and equipped. After each course, we all take an active support role with our students to build more classes around their friends and groups, and encourage ALL officers of ALL riding clubs and motorcycle clubs to be certified in protecting their own. Classes are scheduled by instructors and can be found in a national database on the http://www.RoadGuardians.org website or by calling their main number at (877) 411 - 8551. Chicago, for example, has classes the first Saturday of every month at Cabela’s of Hoffman Estates and is open to the public, riders or not. Call me at (847) 508 - 0652 for further course information or email Chicago ASMI Courses at EMSRoadDocsIL@gmail.com. It’s about the essence of why we ride together, at a whole new level and perspective. Take the course and do something that matters when time counts. When you look to television for motorcycling, you’ll find very little when it comes to news. The news you do see is often bad news, such as the groups who gather to clog expressways to perform acts that belong in closed courses or competitions. Bike Week America is out to change that. 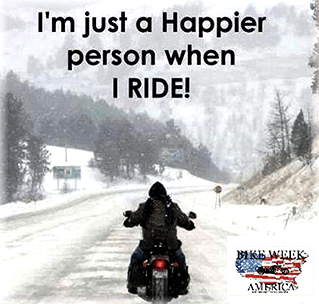 Bike Week America is live, interactive TV show broadcasting from Chicago, whose sole intention is to bring news the everyday enthusiast cannot just relate to, but enjoy learning from. The sole purpose of www.BikeWeekAmerica.com is to bring you the news that mainstream media ignores, OUR GOOD SIDE. It features interviews each week, including world-famous Bike Builder Johnny Lange, Movie Producer Mike Anthony Jones, and the world’s most famous Nomad and “Professional Tourist,” Kevin Bean’re. Most recently, the show interviewed Cris Sommer-Simmons, Sturgis Hall of Famer and wife of Pat Simmons of the Doobie Brothers. They are always looking to help the community with educating and teaching the importance of safe riding, and what to do when the occasional crash occurs. The show is hosted by Dan Nolan, The Bikers Broker and 25 year “professional passenger” Laurie Westberg-Martin, and L.A.M.A. member and 10 year “professional passenger” Gabriella Cyranski. Host Dan Nolan rides two different bikes, a vintage 1984 Kawasaki Voyager VII with matching sidecar for dogs he rescues, and a 1994 Yamaha Virago, which is used for group rides while he works as medical support. He is a member of three medical-based riding groups, The EMS Road Docs of IL, The Rescue Riders, and The Road Guardians, and is active in DuKane A.B.A.T.E. For more information about sponsoring the show, visit http://www.BikeWeekAmerica.com or their Facebook page at www.Facebook.com/BikeWeekAmerica, or call Dan Nolan at (847) 868 - 2289.